Chingrir Cutlet a.k.a Prawn Cutlet is a classic Bengali snack. During my College and University days, I used to visit “Basanta Cabin”, “Kalika”, “Chachar Dokan” etc. for those amazing cutlets and chops. Chicngir Cutlet and a bowl full of Muri (Puffed Rice)…. ahhha heaven!!! I miss badly those Bong snacks here in Gurgaon. 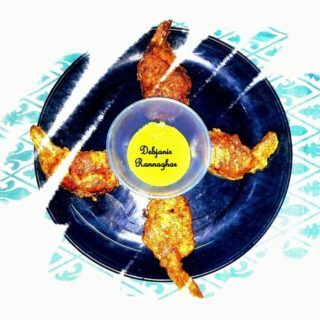 Though Bong snacks are available in C. R. Park and in specialty restaurant in Delhi and Gurgaon, however, the taste of chop- Cutlet from Kolkata based tiny shops are just unbeatable and unparalleled. Chingri Cutlet aka Bengali Prawn Cutlet is a famous seafood appetizer. Green Chilli paste: 1 Tsp. Wash and devein prawns properly. Remove the Shell but keep the tail intact. (refer to the picture). Then again wash prawns and make a slit in the middle (vain area) and cut it half way (it will look like love sign with a tail). Marinate Prawns with lime juice, salt, pepper, turmeric powder, coriander powder, garam masala powder, ginger paste, garlic paste, onion paste, green chili paste. Refrigerate marinated prawns for 3-4 hours. Mix Breadcrumbs with salt, pepper, onion, and garlic powder as well as parsley. Take 2 Eggs and beat them with salt and pepper. Take chilled and marinated prawns and coat a prawn with the crumb mix and then with the beaten egg. Repeat the process for one more time. Then do the same with rest of the marinated prawns. Now it’s time for refrigerating prawn cutlets for at least 8 hours. Heat Vegetable Oil in a deep bottom pan. Deep fry cutlets on low flame to cook prawns properly till the cutlet turns golden brown from both sides. Enjoy hot spicy Chingri Cutlet with Kasundi. If not available with breadcrumbs, take 4 slices of bread/ rusk to prepare breadcrumbs. In case you are using bread then you have to grill pieces of bread for 10 minutes. However, for rusk, you can prepare crumbs directly. I prefer to use bread. Grind the grilled bread or rusk to make the breadcrumbs.